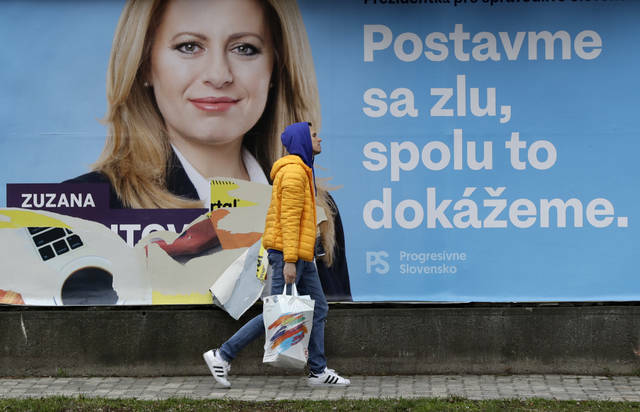 In all, 13 candidates are vying to become the country’s fifth head of state since Slovakia gained independence in 1993 after Czechoslovakia split in two. Kiska supported the huge street protests that led to the fall of Fico’s coalition government amid a political crisis triggered by the slayings last year of an investigative reporter and his fiancee. The reporter, Jan Kuciak, was investigating possible widespread government corruption and Italian mob influence. Caputova, a 45-year-old lawyer, is a rising star of Slovak politics. She became known for leading a successful fight against a toxic waste dump in her home town of Pezinok near the capital of Bratislava, for which she received an international environmental prize in 2016. She was also part of a campaign in 2017 that led to the annulment of pardons granted by former authoritarian prime minister Vladimir Meciar. She is deputy chairman of “Progressive Slovakia,” a non-parliamentary party that supported the massive street protests after Kuciak’s death. 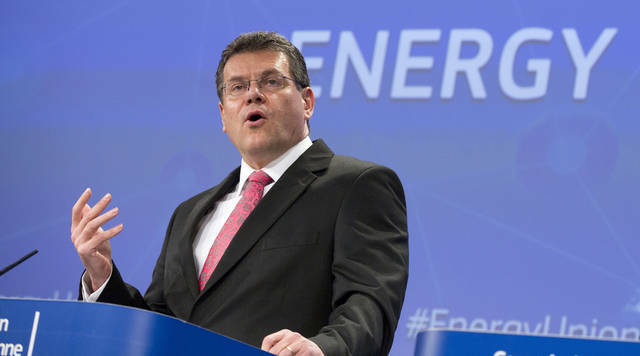 A career diplomat, 52-year-old Sefcovic was a member of the Communist Party before the anti-Communist 1989 Velvet Revolution. Sefcovic accepted an offer to stand from Fico’s left-wing Smer-Social Democracy party, a dominant political group in Slovakia in recent years whose reputation has been tarnished by corruption scandals. The 42-year-old heads the neo-Nazi People’s Party Our Slovakia, which has 14 lawmakers in the 150-seat Slovak Parliament. Kotleba and his party speak admiringly of Slovakia’s time as a Nazi puppet state during World War II. Party members use Nazi salutes and consider NATO a terror group. They want Slovakia to leave the military alliance and the European Union. 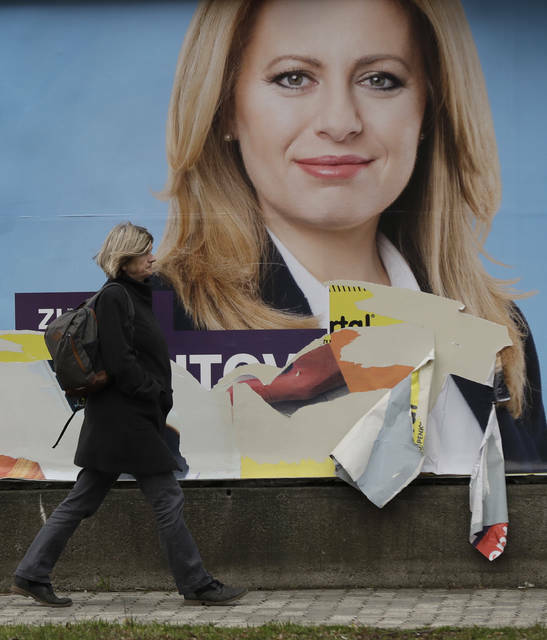 Caputova and Sefcovic are predicted by polls to be the two candidates to advance to a runoff. But the last polls allowed were published two weeks before Saturday’s ballot. Analysts say there’s a room for a surprise result, particularly for Harabin who was running third in the polls. BERLIN (AP) — A group of European nations is urging Russia not to abandon a nuclear weapons treaty with the United States. Germany, Sweden and the Netherlands are also calling for new arms control agreements to address the rising power of China and other nations. The European countries opened an arms control conference in Berlin on Friday urging Moscow “to return to complete and verifiable compliance” to save the treaty. But German Foreign Minister Heiko Maas says it’s also time for broader treaties, as nuclear weapons proliferate to countries such as China, North Korea, India and Pakistan. He says treaties also need to address new technologies, such as drones and cyberattacks. Disclosure statement: James Farrelly does not work for, consult, own shares in or receive funding from any company or organization that would benefit from this article, and has disclosed no relevant affiliations beyond their academic appointment. Something you don’t learn in medical school, however, is how to be on the other side of a diagnosis. But that’s exactly what happened to me 13 years ago when I was diagnosed with a form of blood cancer known as Chronic Lymphocytic Leukemia, or CLL. At the time, I was family physician who had practiced medicine in southern California for several decades. One day I noticed a swollen lymph node on the back of my neck. As a precaution, I ordered a round of blood tests. And while I remember being pleased with my cholesterol level and other parts of the test, my white blood cell count gave me pause. After further tests, I was diagnosed with CLL — and the prospects were grim. The CLL treatment landscape was very different back then. I was hospitalized several times for complications of my disease. I attempted a bone marrow transplant from an unrelated donor that didn’t work. I then entered a clinical trial for a phase one drug that gave me a glimmer of hope. That drug bought me about six years until I relapsed, and the cancer came back. As a physician, I knew that once patients like me relapse, the prognosis is rarely good. When you relapse, old therapies are no longer effective because the cancerous cells have developed resistance. Put simply, my options were more limited than before. I decided to enter a new trial for a treatment known as CAR-T (Chimeric Antigen Receptor-T cell) therapy. CAR-T is a relatively new cellular immunotherapy that involves removing and modifying a patient’s own white blood cells, then returning them to the patient’s body to fight their specific cancer. My cancer was quite aggressive, and I needed an equally aggressive treatment that would give me a durable remission. At the end of the day, I had few viable choices and clearly CAR-T was, by far, my very best hope. My wife and I temporarily moved closer to the hospital where I would receive the treatment in February 2018. Although I realize I was fortunate to have the ability to pick up and move, it was financially and emotionally straining. The treatment itself was physically challenging. I was hospitalized with severe inflammation, mind numbing pain, and the inability to move my legs, eventually having to learn how to walk again. But I recovered quickly. One month after beginning the CAR-T therapy, I received my “restaging” results, which showed that my cancer had become undetectable. I had gone into treatment with most of my bone marrow having cancer and “innumerable” enlarged lymph nodes. One year later, I am pleased to say that I’m still in complete remission with no cancer to be found. But many patients across the nation may not be as lucky as me, since some may soon face hurdles accessing this innovative new treatment. Recently, the Centers for Medicare and Medicaid Services released a proposal regarding coverage of CAR-T. While the proposal was encouraging, it’s my hope that the final language doesn’t lock in coverage that would limit patient access or fail to consider the future of CAR-T innovation. CAR-T science is evolving at a rapid rate. It is being explored for multiple indications, in multiple lines of care, and in a number of settings. We should make sure the decisions the government makes this year consider these important points so patients will have access to CAR-Ts in the present and future for years to come. For a physician-turned-patient like myself, these decisions should be easy. The bottom line is this: We should ensure that all cancer patients have full access and coverage for these therapies. There is perhaps nothing more difficult for a cancer patient than knowing you are near the end of your treatment options. When I was out of options, CAR-T therapy gave me back my life. Thanks to CAR-T, I was able to go back to work and have fully enjoyed every day of life since. This year, I retired after 38 years of practicing medicine. At my retirement party, I was surrounded by my family, friends, colleagues and patients. My hope for patients is that if they ever receive difficult news like I did, they will have access to the best treatments available so that they, too, can have a chance at continuing to lead full lives. Dr. Brian Koffman is a retired medical doctor and the founder of the nonprofit CLL Society Inc. (CLLSociety.org). He wrote this for InsideSources.com.